10 beautiful Christmas tablescapes from some of my favorite bloggers that will 100% inspire your holiday dining room this year! Plus - we're each sharing a few of our top entertaining tips to help you get through the season with ease! Today I've joined up with a few blogging friends to share our holiday tablescape ideas & entertaining tips with you. I love coming together with other creative ladies, because they always inspire me beyond belief. 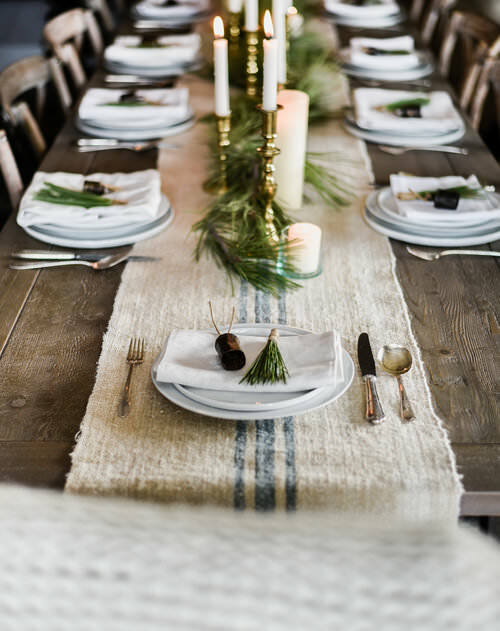 Getting to see everyone's take on "holiday tablescape" is so much fun - each of us has a different touch, and together, we are able to share so much beauty! I like to keep things very simple during the holidays. If you are a usual reader of Boxwood Avenue, you know that I normally use things that I can find outside: greenery, pinecones, branches, etc... I rarely buy decorations, and when I do, it's usually vintage! I used to love sparkles and glitter and ornaments galore, but now I like to stick to a neutral palette of found or vintage items. See that cute little string garland?? Last year I picked up those old cookie cutter bells from Elsie Green - I've been holding on to them just for this purpose! They are rusty, and dirty, and really perfect. I think that we tend to put a lot of pressure on ourselves to create something outstanding or jaw dropping when we decorate for the holidays, but I really believe that less is more. I didn't add soup spoons, I don't have a bunch of glasses on the table, I don't have heaps of decorations...just the necessities for coming together to share a meal. Maybe you don't feel that pressure, but I know I do, and this year I am letting. that. go. While I was decorating this room, I turned to Pinterest for a little inspiration...none of the tables that I was inspired by had candles on them, so my first thought was to leave the candles off. Thinking that maybe my love of candles was no longer in style, but then I realized: if I love candles, then I should put them on my table. I guess what I am trying to say is that if you love sparkles and glitter - add sparkles and glitter! If you can't stand candles, then don't feel like your table will be less than because it's lacking candles. Stay true to your heart, and your room will speak for itself. If you follow me on Instagram, you might have caught a glimpse of my story while I was out cutting branches for this space. I brought home heaps of greenery and my car still smells amazing! I snipped sprigs off the branches and layered them down the center of my table atop the grain sack table runner which was a gift from my (amazing) neighbor. I mismatched the plates to add a little height - the flat plates are from Crate & Barrel and the deeper plate is from World Market. I love their entertaining sets because they are simple and affordable. Someday I will collect enough ironstone to set my whole table...a girl can dream. When we actually sit down for Christmas dinner, I think I will add some sort of paper item. Maybe some Christmas crackers! 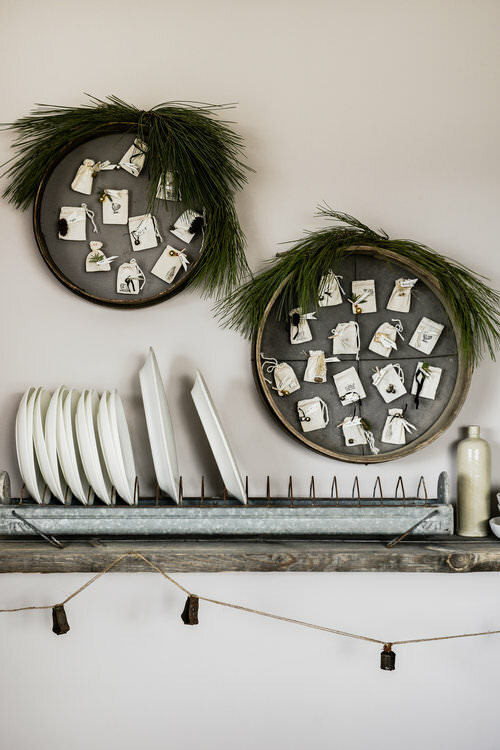 I really love to have a menu, place setting, or activity whenever I dress my table up. There's something so lovely about a really nice item of paper - it's my favorite finishing touch! I am so very excited about my advent calendar, I will share a full post about it on Wednesday, but I love how cute those little baggies look sitting inside the French grain bins. Did you happen to see the giant glass jar? I found that while I was in High Point, it just got here, isn't it amazing!? As I was moving it, a piece of the top popped off and the whole jar fell to the floor, I am so glad it didn't shatter! I would have been so sad. I thought about putting a Christmas tree in the corner where it is sitting, but I think the branches look just right. I hope you have enjoyed seeing our dining room decorated for the upcoming holiday! We are really enjoying our new room and I am having fun with that shelf! 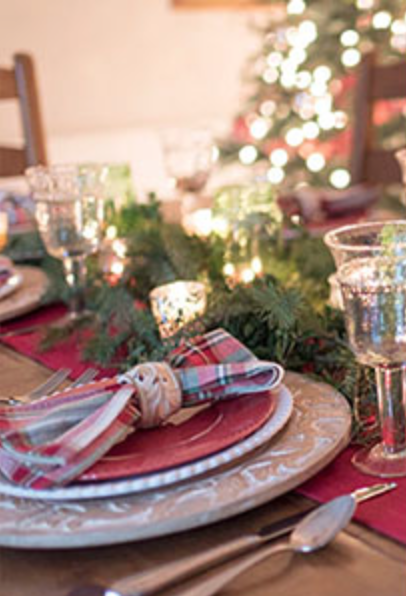 Now be sure to head over to my friends' blogs to see their Christmas tablescape and entertaining ideas! 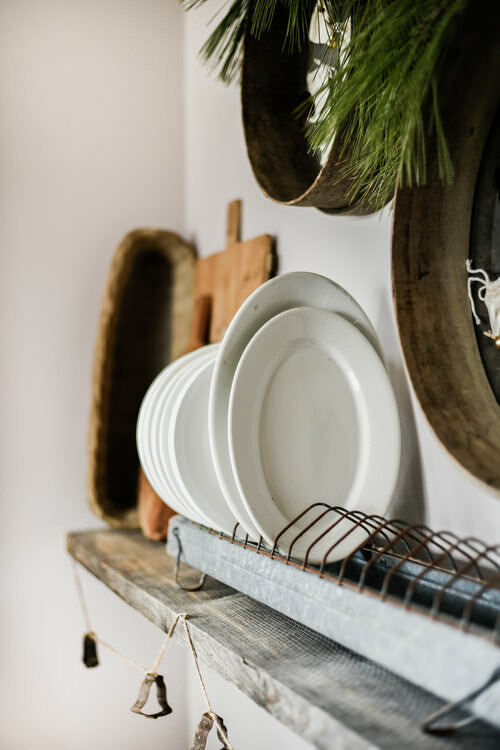 Sign up for more modern farmhouse tablescape inspiration!